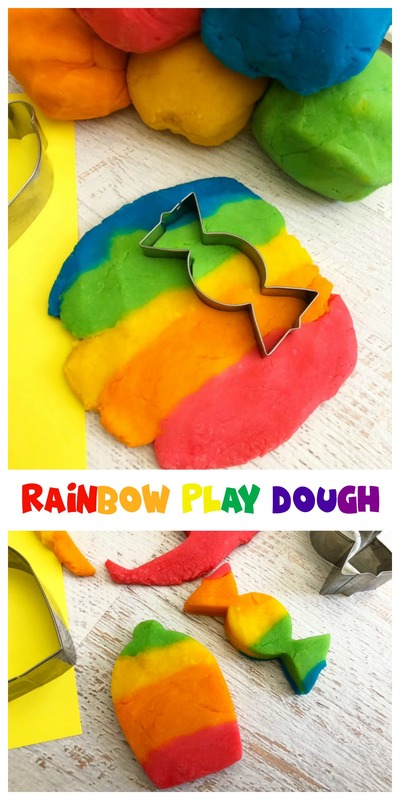 This Rainbow Play Dough is guaranteed to bring your child hours of fun! 1. 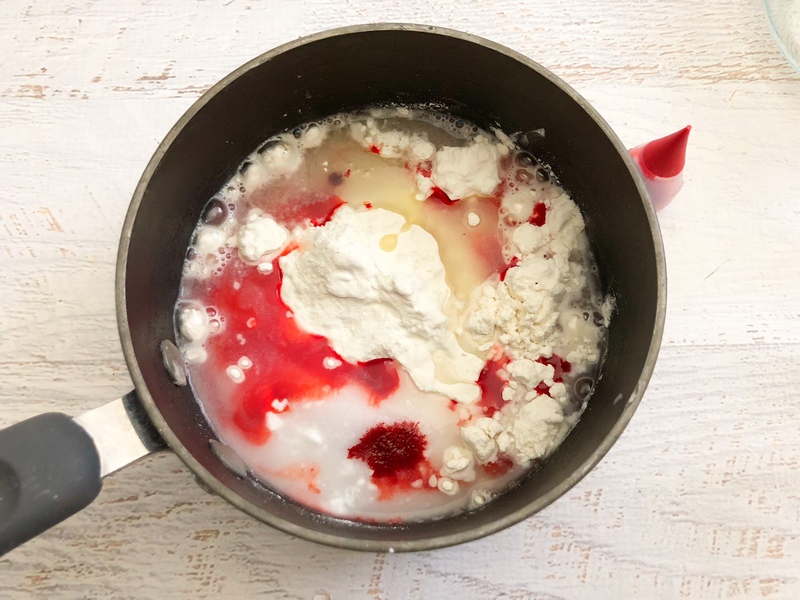 In a small pot, combine your flour, water, salt vegetable oil and cream of tartar along with a few drops of one color food coloring and mix well. 2. Cook on your stove on medium heat for just a couple of minutes, stirring constantly until you have a play dough like consistency. 3. Carefully remove the dough from the pot (be careful because it will be hot). 4. Once it cools down, roll it into a ball and place in a Ziploc bag until you are ready to use it. 5. Repeat steps 1-5 with each color. 6. Place each color next to each other and combine into a ball (or not…whatever you like). Optional: roll in some glitter and your dough is ready to play with. It’s sure to be hours of fun for your kids. 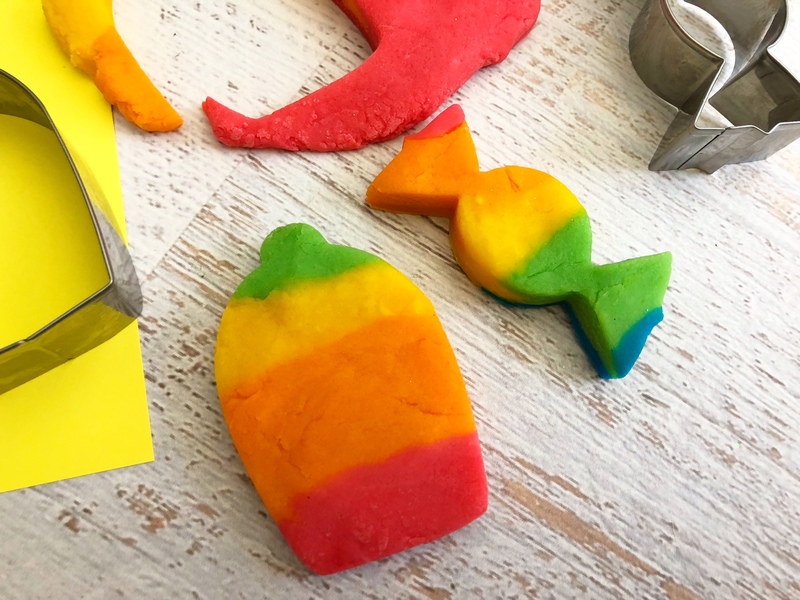 If your child enjoys play dough, try making this homemade Rainbow Play Dough next time. It’s easy to make and sure to be a big hit! That is so much fun! i wish I would have thought to do creative things like this when my kids were little. Oh this is really neat. You’ll be able to use this play dough in so many other activities. Definitely a good craft to always have supplies for. That would be fun to make with the kids! Lots of fun colors which gets the kiddos imaginations going! You really got that creativity gene. This play dough would have been a lot of fun when our kids were young but now i will make this for my niece and nephews. I actually didn’t know it was that easy to make play dough! The colors are so bright and fun I know my kids would enjoy this! This is super cute! I love making homemade play dough like this with my kids. How fun is this! My daughter would love to make this. What is more fun than a rainbow! Oh this is fun! SPring time is around the corner and we need some bright colored crafts in our world! I know my kids would love making this. Homemade play doh is so fun to make. I need to make this for my granddaughter to play with. Love the colors. My daughter tried to make play dough a couple weeks ago and it didn’t turn out. Will have her try your recipe. This is a great rainy day project to make with the kids and then let them play with it. 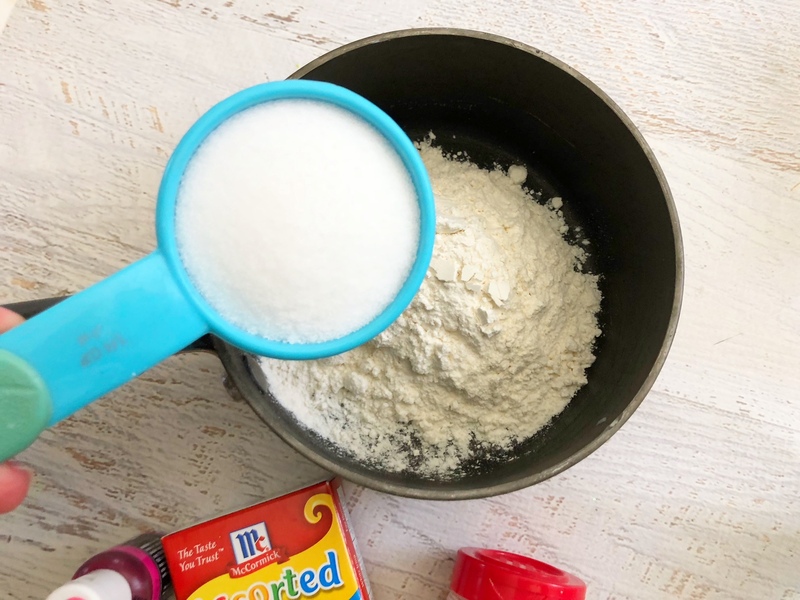 My kids love to help in the kitchen and I know they would love to be able to make their own homemade play-dough!! This looks really fun! Kids will surely love this! I love how colorful your rainbow play dough is and it would be perfect to make for the kids to celebrate St. Patrick’s Day. I always enjoy playing with play dough with the kids. It’s something I’ve never outgrown. We have made our own play dough for years. There are so many ways to go about it. Like how bright your colors are. I made play dough years ago! I think I added glitter to mine because my daughter was obsessed with it. 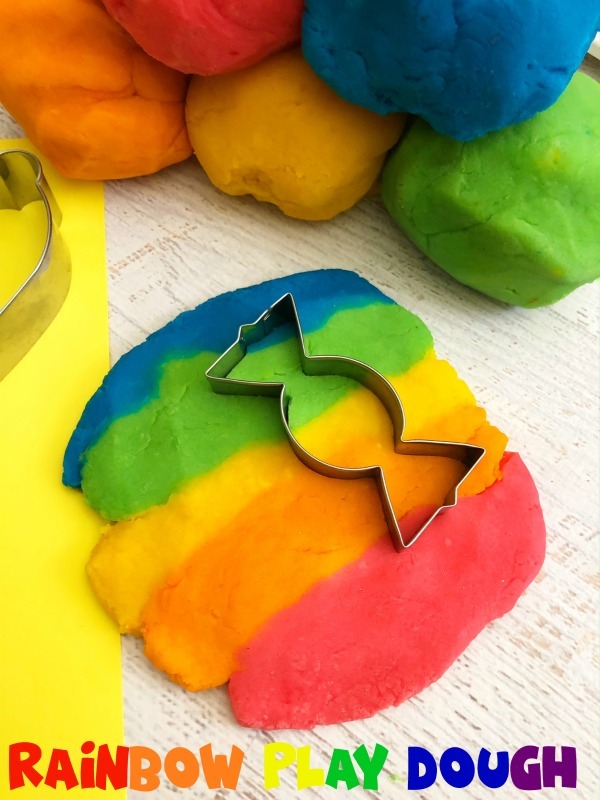 She’ll love this rainbow Play Dough! So much fun to make especially with the kids and I’m sure they’ll have a great time playing with it after. I cannot wait to share this with my daughter so she could make it with her kids! Homemade play-doh is so much better than store-bought. Love the idea of making it rainbow. It’s perfect to make for St. Patrick’s Day! How pretty. I never thought of making my own play dough before. But I love that you could do all kinds of themes with it this way. Oh I LOVE this! Rainbows are our favourite thing and I think making this is just as much fun for the kids as playing with it! I have been wanting to try making one as well and here I am reading your post! My daughter loves playing with playdough and this is wonderful! We used to make homemade playdough all the time when my kids were younger. One year we even made playdough ornaments with the kids at our church. It’s cheap fun because most of the items are just pantry staples. Good family fun. My 6 year old loves play doh. She has a variety of cookie cutter and everything. I’m pinning this to make. The kids sure will love this one! They are big into play dough lately! I’ll definitely make this when my nieces and nephews decide to visit! I’m sure they’re going to love having a rainbow play dough also, it would be fun to allow them to help make it! I think this looks like fun. Your colors are so brilliant. That makes playing with playdough so much fun. I appreciated seeing what it looks like to make it. I would have never guessed it would look like that! Very colorful and fun to make. You made it sound so easy to make lol, thank you for sharing how. This is such a perfect St. Patrick’s day craft if you have to come up with a non food focused activity for a classroom. I love how bright your colors came out. My daughter loves play doh but I can’t stand the smell of it. This may be a good alternative for us. I’m going to give this a try. Thanks for sharing! I could have used this recipe this past week when the grand kids were out of school. I’m going to make some up and be prepared for their next school holiday. The colors are so vivid and that’s what they like. Play-doh has always been something fun for my kids. The texture and different colors seem to make everybody happy. I am going to do this for my sons class! I have to send some homemade stuff in 3x times and my 2nd time is March, so this is what I’m going to do for them! I bet they love it! I love all the different colors! I should make some Play Dough with my nephew Edison. He’s the perfect age for it.